The influx of Hispanic immigrants has brought a wave of Latino culture to the U.S. According to the U.S. Census Bureau, the Hispanic population accounts for 56 percent of the nation’s growth in the past decade. 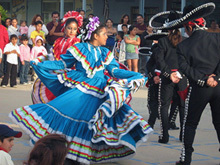 Hispanic Heritage Month — the celebration of that culture — is Sept. 15 through Oct. 15. Throughout Hispanic Heritage Month, many organizations commemorate and recognize the accomplishments and advances made by Hispanic Americans, and promotes young Hispanics into leadership. One such organization is the Congressional Hispanic Caucus Institute or, CHCI. “This year’s Hispanic Heritage Month theme and events reflect the strength and immense contributions of Latinos to the United States while focusing on the unity and leadership we must continue to develop to ensure the future success of this great nation,” said Charles A. Gonzalez, CHCI Chair, in a press release. They also are hosting many events and award ceremonies from Sept. 11 through Sept. 14. For more information or to join go to chci.org. The number of Hispanic 18- to 24-year-old college enrolled students grew by 349,000 from 2009 to 2010, earning themselves the largest minority on college campuses. OCCC has many different people with diverse heritages. Among those heritages are many Latino backgrounds. OCCC’s Student Life is commemorating Latino culture on Sept. 15. The college will have a performance by Mariachi Orgullo, Oklahoma City’s own Mariachi band. The performance will be held in the College Union near the cafeteria. “In my family, my mom makes the same food her great grandparents made in Spain. I feel most connected to my culture in that and in Spanish music,” said Mikela Delfino, OCCC student. Student Dillon Espinoza said although he was born in the U.S., “ … it’s important to remember where you and your family come from. “In the U.S. we’re so diverse we need to remember our cultures to pass on. Modern Languages Professor Ginnett Rollins said she feels as though language plays a huge role in a culture’s heritage and shouldn’t be forgotten. “There’s so many aspects of culture that affect language, you can’t really separate them,” Rollins said. Of the many clubs on the OCCC campus, the Hispanic Organization to Promote Education club is particularly active, having many events throughout the school year. According to their website, HOPE stays involved in everything from Latino candy sales to taco booths. HOPE’s mission statement sums it up. For more information and events visit the HOPE website at occc.campusgroups.com/hope.